This film is set during the time of the civil war in Sierra Leone in the 1990s. It is a story about three characters - Solomon Vandy, a fisherman played by Djimon Hounsou, Danny Archer, a diamond smuggler and arms trader played by Leonardo DiCaprio and Maddy Bowen, an American journalist played by Jennifer Connelly. Solomon and Danny are both African but they have grown up in different circumstances and have had very different experiences. 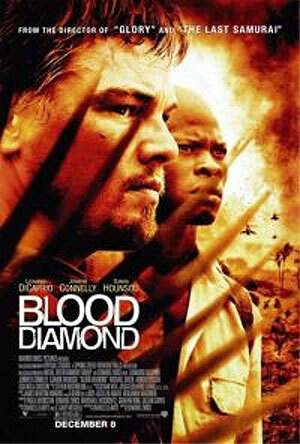 Solomon is taken from his family and forced to work in the diamond fields where he finds a large rare pink diamond. He hides this diamond at great personal risk and comes into contact with Danny and then Maddy as a result. Danny sees the existence of the diamond as a way out of Africa and Maddy is interested in telling Danny’s story about diamond smuggling. Through these three people the audience is shown the effect that diamonds have had on the people in Sierra Leone and how international countries have played a part in it. This is a well written and acted film with three convincing performances from Djimon Hounsou, Leonardo DiCaprio and Jennifer Connelly. At times it was difficult to watch this film as it is quite violent in places but it is well worth a viewing. It makes you think about precious stones, where they have come from and what people went through to get them. Cubic zircona anyone? Many thanks to 2fm and MOTP for the free tickets. How did you end up getting those free tickets exactly??? Must go see this film while it's still in. # posted by Pure Cork Boy : February 02, 2007 5:16 p.m.